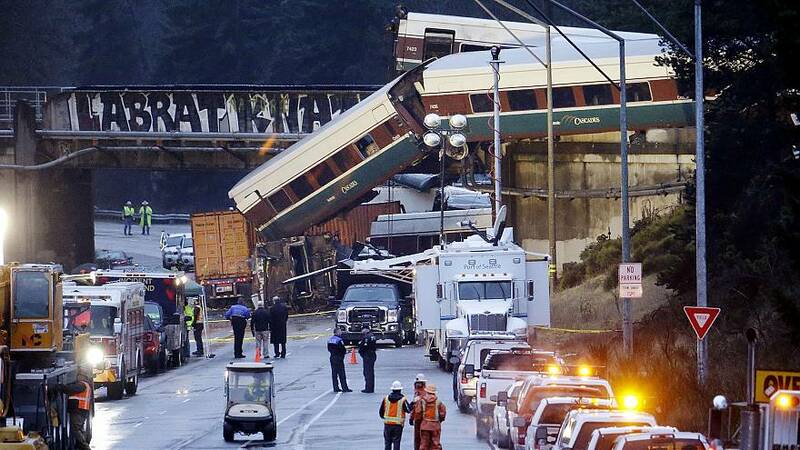 The train that careened off a bridge outside Tacoma, Washington, killing three people was traveling at 80 mph on a 30-mph stretch of track, federal investigators confirmed late Monday. During a late-night briefing with reporters, NTSB board member Bella Dinh-Zarr added that Train 501 of Amtrak's Cascades service from Seattle headed south to Portland, Oregon, was carrying 80 passengers, three crew and two service personnel. She said it was "too early to tell" why the train was travelling at 80 mph. "We were glad that we were able to get the data from the event data recorder from the rear locomotive," she said at the briefing. "The front locomotive as you can imagine is a bit more difficult to access." The train was made up of 12 cars and two locomotives — one at the front and one at the back, Dinh-Zarr said. Only one locomotive remained on the tracks after the crash, according to the Washington State Patrol. Overnight, several cranes moved to the scene of the accident. Washington State Police spokesman Dan Hall earlier said that 72 people were taken to hospitals after the 7:33 a.m. PT crash following the opening of a highly touted new rail link. Five cars and a pair of trucks were involved in the highway pileup, but no motorists were killed, officials said. It was unclear if the dead were passengers or crew. Hall said that 10 of the wounded remained in serious condition and one was medevacked to a trauma center at Harborview Medical Center in Seattle, roughly 50 miles away. In a statement, Amtrak said it was "deeply saddened by the loss of life and injuries" and working closely with victims and their families. "There is a thorough investigation underway to determine what happened," the statement said. "The investigation will be conducted by [the National Transportation Safety Board], and we will cooperate fully with all authorities. At this time, we will not speculate about the cause, and we encourage others not to speculate as well." Earlier, an Amtrak official said the train was not using a technology called positive train control, which can prevent derailments caused by excessive speed. The train was traveling on newly refurbished tracks that are part of a new route designed to offer speedier service south of Tacoma. Passenger Chris Karnes told MSNBC that the train had just passed the city of Dupont when it jumped the tracks. "At a certain point the train started to wobble a little bit, and the next thing that we knew we were down in a ditch," Karnes, a member of a local transportation advisory group, said. "The train had crumpled." He spoke as a rescue operation was still underway, describing injured people being lifted out of the wreckage. In recordings of emergency radio conversations in the immediate aftermath, a member of the train crew told a dispatcher briefly what happened. "We were coming around the corner to take the bridge over I-5 there, uh, right north of Nisquallyand we went on the ground," the crew member said. After the dispatcher asked if everyone was OK, the crew member responded: "I'm still figuring that out. We got cars everywhere and down onto the highway." Detective Ed Troyer, a spokesman for the Pierce County Sheriff's Department, told reporters that even though the crash site was "pretty horrific," no one in any of the vehicles was killed. Amtrak service south of Seattle was temporarily suspended, the company said. The derailment happened on a newly established Amtrak route aimed at adding more frequent, more reliable and faster service between Seattle and Portland, part of an $800 million project called the Cascades High-Speed Rail Capital Program. The new route, called the Point Defiance Bypass Project, was billed as an improvement over lines that hugged the scenic Puget Sound, but included tight curves and single-track tunnels. The new route uses an existing rail line that runs along Interstate 5 from south Tacoma through Dupont before reconnecting with the main line. The improvements also included a new Amtrak station in Tacoma. The tracks on the bypass, previously used for freight and military transport, were taken over and refurbished by SoundTransit, a local transportation agency, as part of the rerouting project, officials said. The Cascades service is jointly owned by the state transportation departments in Washington and Oregon, with Amtrak running the service as a contractor and maintaining responsibility for day-to-day operations. Don Anderson, mayor of Lakewood, a city along the new route, said he was among many in the area concerned about the speed of the trains that would be traveling through their communities. He said he was part of an unsuccessful bid to stop the switch, or change it. "Our community has been very concerned about the safety of this modification of the rail route for several years," Anderson told MSNBC's Andrea Mitchell. President Donald Trump first tweeted that the crash was a reason to support his planned infrastructure bill. The president soon followed up by tweeting: "My thoughts and prayers are with everyone involved in the train accident in DuPont, Washington. Thank you to all of our wonderful First Responders who are on the scene. We are currently monitoring here at the White House." On the prior route, along the Puget Sound,an Amtrak Cascades service train derailed in July with 267 people on board as it approached a drawbridge, leaving several injured. Monday's Washington State crash was the first railway accident with multiple fatalities since May 12, 2015, when an Amtrak train derailed in Philadelphia, killing eight people and injuring more than 200.